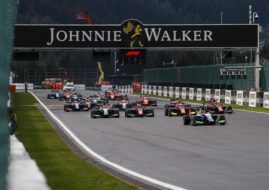 The GP3 Series rookie Jack Aitken (ArdenMotorsport) scored his maiden GP3 victory at Spa-Francorchamps today, in the action-packed race full of incidents, interrupted by four yellow flag and Safety Car periods. Antonio Fuoco (Trident Motorsport) and Santino Ferrucci (DAMS) completed the podium. Aitken started fourth on the grid and progressed to the top during opening two laps, taking the lead from reverse-grid pole-sitter Matevos Isaakyan. After that, Aitken controlled the race until the chequered flag. Fuoco and Ferrucci also overtook Isaakyan, leaving the Russian driver without podium. The championship leader and winner of yesterday’s race Charles Leclerc finished sixth, losing one place on the last lap from Jake Dennis. Three interrupionts were caused by accidents of Tatiana Calderon, Konstantin Tereschenko, Jake Hughes, Matt Parry, Nirei Fukuzumi and Kevin Jorg.